Globally, 30% of women have experienced physical and/or sexual violence by an intimate partner (IPV) during their lifetime . IPV prevalence is likely higher during humanitarian crises, when women and girls, men and boys, are more vulnerable to violence in the family and community, and during displacement [2-7]. In fact a growing body of evidence suggest that IPV is the most common form of violence in humanitarian settings but that it often receives less attention than non-partner sexual violence during conflict or humanitarian crisis [2, 8-11]. Evidence suggests a number of factors contribute to the increase in violence, in particular within the family unit: the trauma of displacement, disruption of gender norms, additional stresses due to loss of livelihood, and isolation from community and family support systems . Recent evidence reviews highlight the limited evidence on effective IPV prevention interventions for the humanitarian context, and emphasize the need for development and evaluation of IPV interventions for these settings . Targeted solutions to address and prevent IPV are particularly challenging in humanitarian settings such as refugee or internally displaced persons (IDP) camps, where there is an emphasis on service provision rather than long-term programming and typical prevention programs such as curriculum-based group sessions may be too costly to scale or inappropriate for mobile populations. Technology-based solutions to address GBV have received growing interest because of their potential to reach large numbers of individuals quickly and non-intrusively, yet have limited application in settings where internet, mobile phone networks or access to FM radio is limited or non-existent . Together with colleagues Dr. Jennifer Scott and Dr. Negussie Deyessa, our team’s ongoing project, with recent funding from the World Bank Group and the Sexual Violence Research Initiative, aims to develop and pilot test an innovative, technology based solution to prevent IPV that is not dependent on internet or mobile phone connectivity. 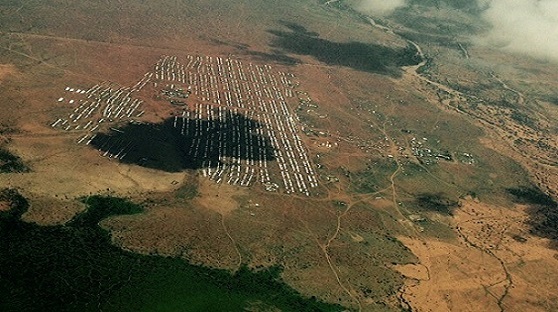 The project is being implemented in Dollo Ado Refugee Camps in Ethiopia, home to an estimated 212,000 Somali refugees who are displaced as a result of war and drought. Previous research conducted by our team in 2016 identified the social and cultural drivers of IPV among the refugee population in Dollo Ado, including changing gender roles, early and forced marriage, Female Genital Mutilation (FGM), and an increase in use of the ubiquitous stimulant plant called khat (Catha edulis) which has been triggered by displacement. The first stage of the new study will involve additional qualitative research to further understand IPV and its drivers, social networks and key influencers, as well as the main channels of communication and information sharing in this Somali refugee setting. In the current pre-implementation stage we are finalizing study protocols and instruments which will be submitted for ethical review at the Harvard T.H. Chan School of Public Health and the Addis Ababa University institutional review boards (IRBs). Our multi-disciplinary team of physicians, academics, practitioners and journalists from Fondation Hirondelle, Harvard T.H. Chan School of Public Health, Addis Ababa University School of Public Health and Women and Health Alliance International (WAHA) Ethiopia, will work with the Somali refugee population, to create a series of user-developed podcasts on IPV, which can be easily shared via multiple channels in safe environments. Men and women in the camps will be trained in digital storytelling and podcasting. They will develop podcast content relevant for their context and in the local language, with messaging that they believe will transform gender norms and behaviors in their community. Empowering people to share stories and solutions, these user-developed podcasts create opportunities for community-based dialogue and advocacy to sensitively challenge and transform inequitable gender and social norms and to ultimately decrease prevalence of IPV. This unique participatory approach and human-centered technological innovation enables individuals to create solutions to improve their own lives and communities. The podcasts will be broadcast at “Listening Centers”, safe spaces where the target population usually gathers within the camp, and will also be available for download and peer-to-peer sharing via Bluetooth technology. The podcasts will be pilot tested to assess participant satisfaction and comprehension, as well as relevance of the content and the approach. Overcoming the “digital divide” to address what is a taboo topic for many is not without its challenges. For many project participants, they will be learning to use digital recording technology for the first time, discovering the power of radio podcasting through a bespoke ‘network’ created through peer to peer sharing and Listening Centres. Equipment and technology will be well adapted to camp environment, solar powered and sturdy so as to provide a sustainable utility after the project ends.